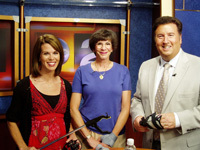 Julie Belkin, founder and president of 3-Point Products (pictured in the center), was interviewed on television about her experience as someone who suffers from arthritis, has treated arthritis patients as an occupational therapist and founded a company that focuses primarily on arthritis-related products. She has designed a number of arthritis splints for fingers, thumbs and wrists, some of which she wears herself. Among other things, the video shows her discussing two of these splints and a reacher, a type of product Ms. Belkin recommends to every household. This blog is presented for informational purposes for health care professionals. We will gladly answer questions pertaining to products, however, we are unable to provide specific patient diagnoses or treatment recommendations. Are you a Patient or Consumer? Checkout the Oh My Arthritis Blog with helpful information on how to live your best life with arthritis and other health conditions. Be the first to receive our latest blogs!